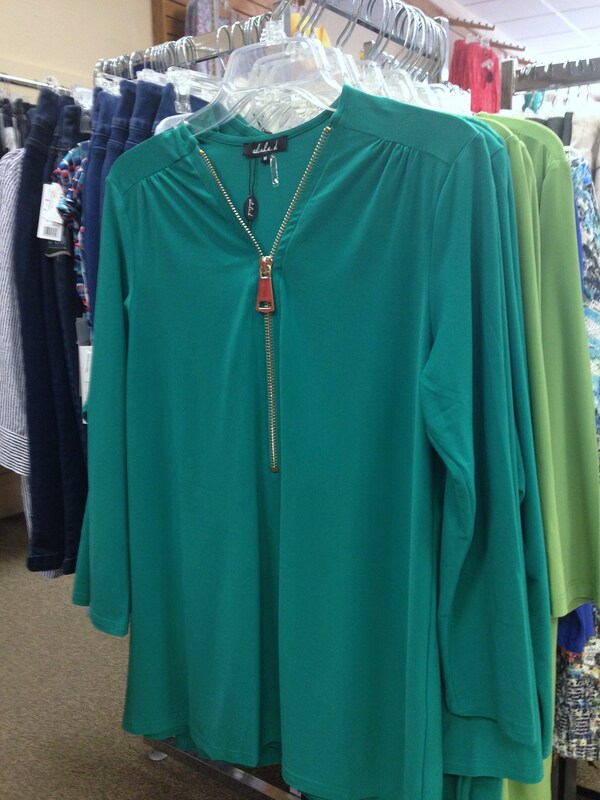 This week we are highlighting one of our fabulous lines at Fashion Crossroads called Foxcroft. Now through Friday, come in and try on one of these fabulous wrinkle free cotton blouses and you can register to win a FREE Foxcroft Blouse of your choice from our store! The winner will be chosen at closing on Friday, March 27th and notified on Saturday, March 28th. I have to tell you, I am very impressed by these blouses. I have to admit, I was a bit dubious about wrinkle free cotton. So, I determined to purchase one myself and put it to the test! I thought a perfect trial for such a claim would be a trip, so I packed my new Foxcroft blouse at the bottom of my suitcase (under the rest of my clothes and shoes) and waited to see how it looked when I arrived at market in Las Vegas. To my surprise, the blouse came out of my suitcase without any wrinkles! My next test was to wear it on hell day…Monday at the Women’s Wear and Nevada Show where we work from 9 a.m .to 8 p.m. This very long day is spent in a tight schedule where we have a new vendor to see every hour. I walk a lot going from vendor to vendor and I sit a lot while I’m placing my orders. What better test for a blouse than constant up and down? I wore it out over my cropped jeans, and it did not crease at the waist, despite the hours I spent sitting and writing orders. Okay, so now I was becoming VERY impressed. I even wore it a second day while I was at market because it looked so fresh and crisp! White cotton Foxcroft blouse that I wore at market and available on our online store. The final test was to again pack it beneath my clothing in my suitcase on the way home. By this time, I was not surprised when I took it out of my suitcase, unwrinkled. http://Fashion-Crossroads-Inc.shoptiques.com. Just look for the Foxcroft blouse. If you live here in Casper, then this is the week to come in and give this line a try! Who knows, maybe you could be the lucky winner of new Foxcroft blouse! As the spring merchandise keeps flowing in, I am getting more and more excited for warmer weather. It is so refreshing to change your closet over from dark, heavy winter fabrics to light, airy, summer styles. But even more exciting than the color and fabric change are the the new trends for the season. I wanted to highlight a few trends you’ll be seeing quite a bit this season and encourage you to try at least one! We’ve seen zip sweaters play a big role this winter season. The heavy gage zipper as embellishment trend continues into summer with zip necked tops like this one on the left from Lior. Pair this style with a printed legging in a coordinating color and some cute sandals, and you’ll have a trendy look for your summer barbecue! We also have this top in royal blue, and I love it with printed black and white leggings. The two together are edgy and oh so cute! 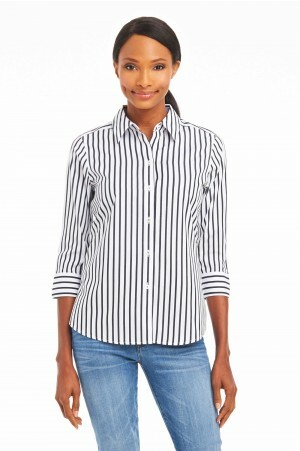 Of course this style also works well with skinny jeans or boyfriend jeans (rolled at the ankle). fitting top underneath or a tank. At market, the trendier girls wore their kimonos with shorts but you can dial down the style a bit by pairing them with skinny ankle pants as well. I love this one from Ryu pictured on the right. The soft blue is very denim friendly and the crochet and fringe embellishment make it hip. 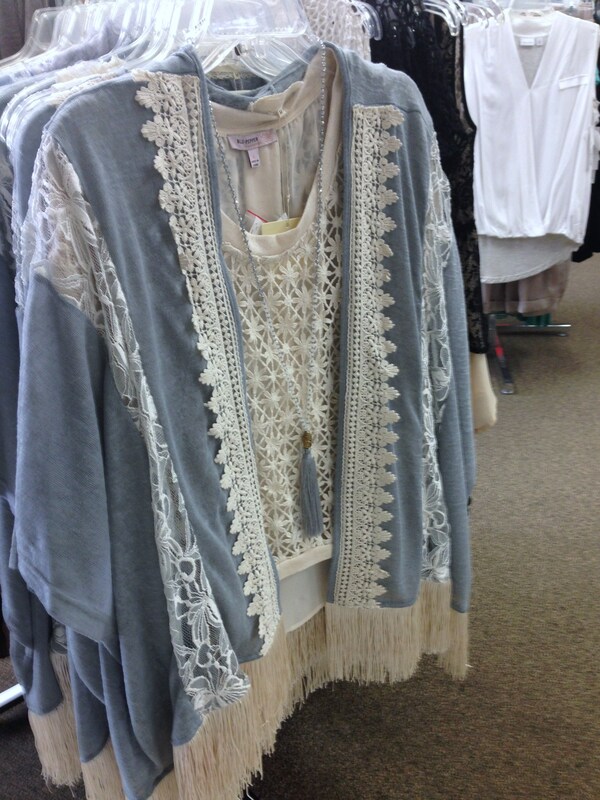 We’ve layered this one with a lace tank in ivory and finished off the look with a tassel necklace. So cute! This is a great option for denim capris, skinny jeans or boyfriend jeans. These also work well over skirts and dresses too. Crochet is queen this season! And why not, it’s hip and feminine. an embellishment, but the far more trendy way to wear it is as a crochet top. Look at the example on the left. This is such a light, airy style that works great to hide a thick middle and looks amazing worn as head to toe neutral, paired either as a cream and white or cream and tan combo. (Cream crochet with white pants, for example). While this style definitely hearkens back to the 70’s, it’s more feminine than hippie this season. Boyfriend style high low looks great with loose silk pants for a casual and chic look. is a marriage of the boyfriend tee (oversized) and high low tee (shorter front than back). 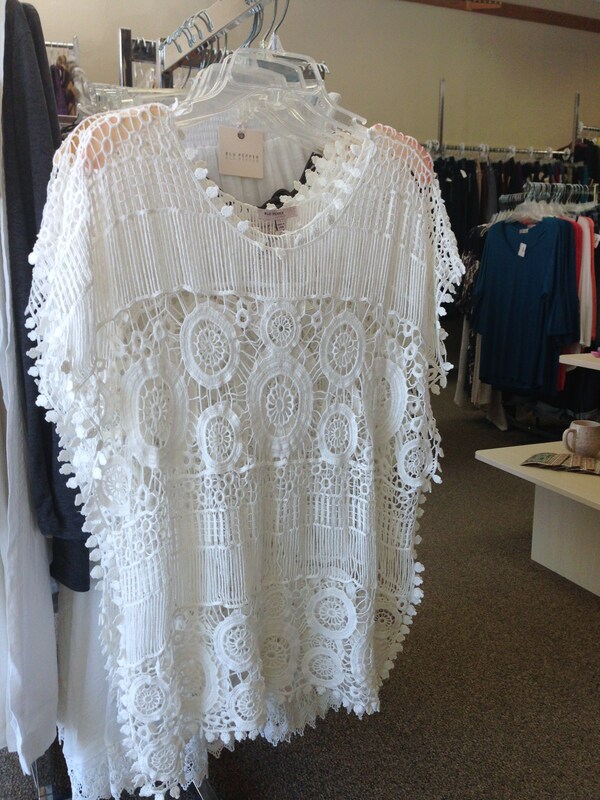 This loose fitting, airy style works well paired with slouchy silk or linen pants. It also looks amazing with jeans. Notice again the strong neutral trend with a white front and heather grey back. 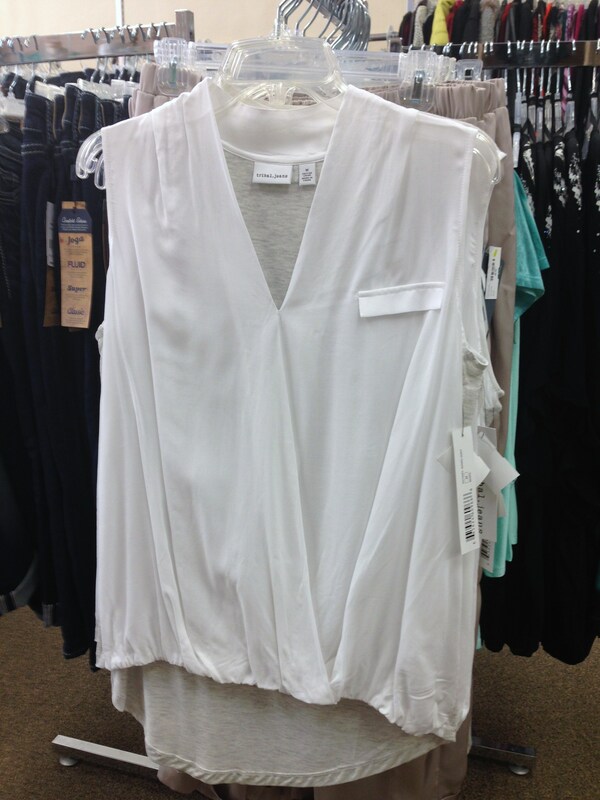 Style tip: this top is okay to wear with jeggings but not with leggings. Why? Leggings cling too much in the front so you want to make sure you cover them with a longer top. Because jeggings use a thicker fabric, they don’t cling and can therefore handle a shorter top that doesn’t cover your crotch area. Keep it classy ladies! I hope this blog inspires you to try one of these new styles this spring. Embrace a new trend this season. It will give your whole wardrobe a lift!